Titanosaurus is the signature member of the family of dinosaurs known as titanosaurs, which were the last sauropods to roam the earth before the K/T Extinction 65 million years ago. 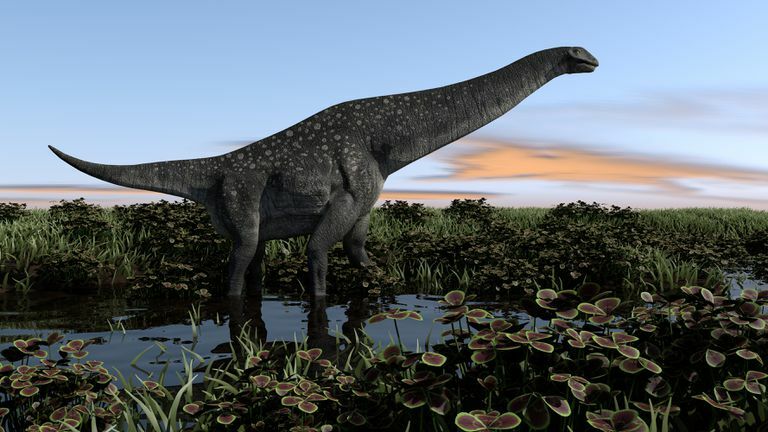 What's odd is that, although paleontologists have discovered plenty of titanosaurs—the remains of these giant beasts have been dug up all over the globe—they're not so sure about the status of Titanosaurus: this dinosaur is known from very limited fossil remains, and to date, no one has located its kull. This seems to be a trend in the dinosaur world; for example, hadrosaurs (duck-billed dinosaurs) are named after the extremely obscure Hadrosaurus, and the aquatic reptiles known as pliosaurs are named after the equally murky Pliosaurus. Lately, titanosaurs (but not Titanosaurus) have been generating headlines, as bigger and bigger specimens have been discovered in South America. The largest dinosaur yet known is a South American titanosaur, Argentinosaurus, but the recent announcement of the evocatively named Dreadnoughtus may imperil its place in the record books. There are also a few as-yet-unidentified titanosaur specimens that may have been even bigger, but we can only know for sure pending further study by experts. Meet the Dinosaur Anatotitan, Meaning "Giant Duck"